An A fork saddle is a type of slick fork saddle with a fork (or swells) that are shaped similar to a capital letter “A” when viewed from the front. 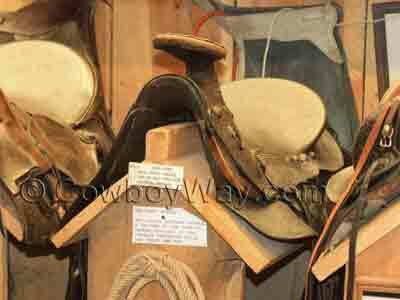 A fork saddles were common in the early development of the modern Western saddle and they still have many fans today. For more information about a fork saddles and saddle forks in general, please scroll down beneath the saddles for sale. Below: An A fork saddle. Is It Your Kind Of An A Fork? When shopping for an A fork saddle on the Web or anywhere else make sure you and the seller are talking about the same type of saddle. For example, it’s not uncommon for some people to refer to any type of slick fork saddle (such as a Wade) as an A fork, and these folks use the terms “A fork” and “Wade” interchangeably. However, Wades have characteristics not common to all A forks, and therefore not everyone considers them to be in the same group. When shopping for saddles, make sure you know what style of saddle you’re looking at and if it’s what you’re after. For more information about saddle forks please scroll down beneath the saddles for sale. Saddles are both new and used. Shipping may or may not be included in the prices shown on eBay – be sure to read the description to see if shipping charges are included or extra. Shipping is usually included on the prices shown for HorseSaddleShop and State Line Tack. However, always double check to be sure. A Fork Saddles: Forks and Swells and Pommels, Oh My! The area at the front of a saddle is called the fork, the swell, or the pommel. 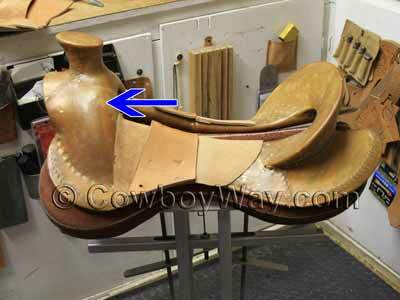 While it’s common to use any of these terms interchangeably when referring to Western saddles, the word “pommel” is used almost exclusively for English saddles. Below: On this bare saddle tree the blue arrow is pointing to the area on a saddle referred to as the fork, swell, or pommel. The fork has an upward arch to allow room for the horse’s withers underneath it, and has a saddle bar attached to either side at the bottom (which can be seen on a bare saddle tree but not on a finished saddle). In a Western saddle, the saddle horn is at the top of the fork. The forks of a Western saddle fall into two broad categories: Slick forks and swell forks. Slick fork saddles have forks that are low with little or no swell to them. Described another way, a slick fork is widest at its bottom where it connects to the saddle tree bars. An a fork saddle is a slick fork saddle. 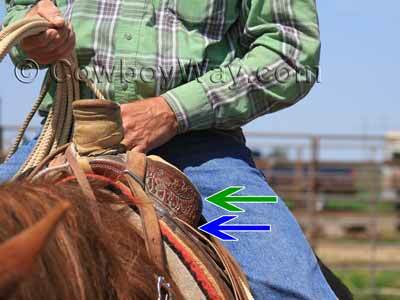 Below: The blue arrow is pointing to the bottom of the saddle fork. Since the widest point of the fork on this saddle is at the bottom, it is a “slick fork” saddle. Swell forks saddles have forks with a bulge or swell to them and therefore are not widest at the bottom. Exactly how much swell and the shape of it varies. Below: The blue arrow is pointing to the bottom of the saddle fork and the green arrow is pointing to the saddle swells. Since the widest point of the fork on this saddle is at the swells, it is a “swell fork” saddle. As we said above, an a fork saddle is a slick fork saddle. An a fork has a steeply sloping shape when viewed from the front similar to a capital letter “A,” which gives this style of saddle fork its name. 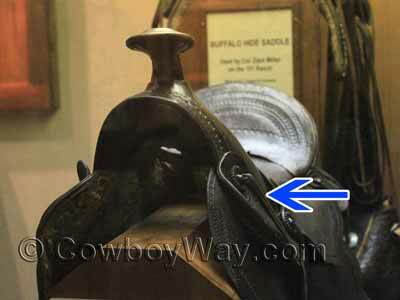 Below is a photo of an A fork saddle on display at the Don King Museum, a wonderful museum inside of King’s Saddlery in Sheridan, Wyoming. 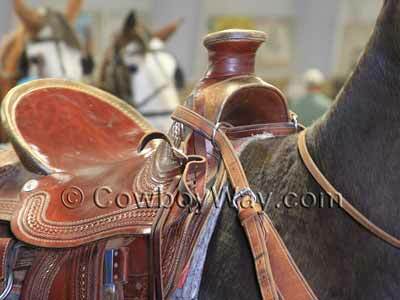 It’s a type of saddle called a “Hope” saddle, a style of saddle named after its designer and maker, Adolphus Hope. Mr. Hope opened a saddle shop in Washington County, Texas in the 1830s and began making saddles that, among other characteristics, had low, broad horns and “A” shaped forks. 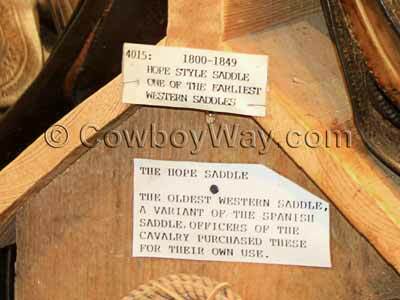 Many saddle historians consider the Hope saddle and others like it to be the predecessors of the modern Western saddle. Below: An early A fork saddle in a museum. It is similar to the “Hope saddle,” an early style of A fork saddle. Below: A close-up of the labels on the above saddle.